Election day is coming up November 6. Will you take 30 seconds to double check that you’re registered to vote? Here’s the link to check. And here’s the deadline to register in your state in order to vote in the election. Ask the college kids in your life if they’re registered to vote and if they need help getting to the polls on election day. Ask friends and family if they need help with childcare or help getting to the polls on election day. Get a group together to phonebank. Donate to candidates in swing districts. This week was rough. I hope it makes you feel better to do a few concrete things to try to repair some of the harm that has been done. And in the meantime, I hope you eat some cake, too. Sending hugs all around. 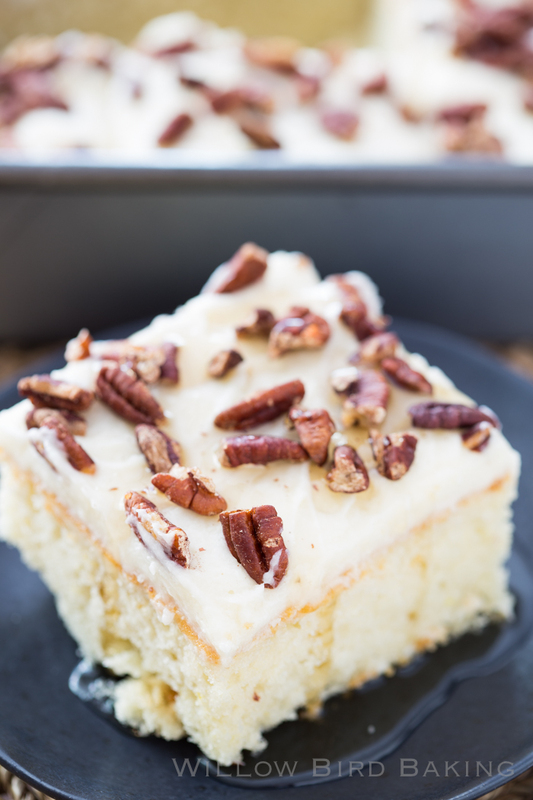 This Maple Cake with Whipped Icing is the perfect simple maple snack cake for fall, topped with clouds of my favorite fluffy whipped icing! To make the cake: Preheat the oven to 350 degrees F and grease an 8-inch square baking pan (I also place a greased sheet of parchment in the bottom for extra assurance.) 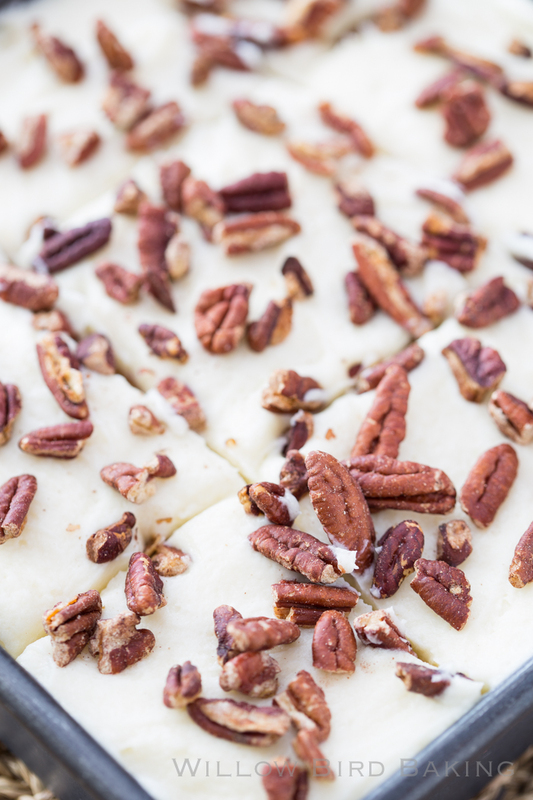 Cover a separate baking sheet with aluminum foil and toast the pecans for 5-6 minutes, stirring occasionally, or until toasted and fragrant. Set aside to cool. In a medium saucepan over medium heat, bring the butter and water to a boil. In the meantime, in a separate large bowl, whisk together the cake flour, sugar, baking soda, and salt before whisking in the egg, sour cream, almond extract, vanilla extract. Mix to combine. While mixing, slowly pour in the boiling butter and water mixture. Mix to combine completely. Your batter will be very runny. Pour the batter into the prepared baking pan. Bake at 375 degrees for 17-22 minutes or until a toothpick inserted in several places comes out with a few moist crumbs. Let the cake cool completely (I even chill mine a bit). While the cake bakes, prepare everything to start your frosting. While the cake bakes, heat the milk, flour, and granulated sugar together over medium heat, whisking constantly. Once it starts to boil, continue whisking and heating it for around 7 minutes or until it’s very thick, like cake batter consistency. Remove the mixture from the heat and add the extracts. Remove the mixture to a shallow pan and let the mixture cool completely (after a bit, I stuck mine in the fridge to hurry it along). Once the mixture and the cake are both completely cool, beat the butter in the bowl of a stand mixer until soft and fluffy. Add the completely cooled mixture and beat on high until you have fluffy frosting the consistency of stiff whipped cream (this takes several minutes, so be patient). Frost your completely cooled cake with a thick layer. 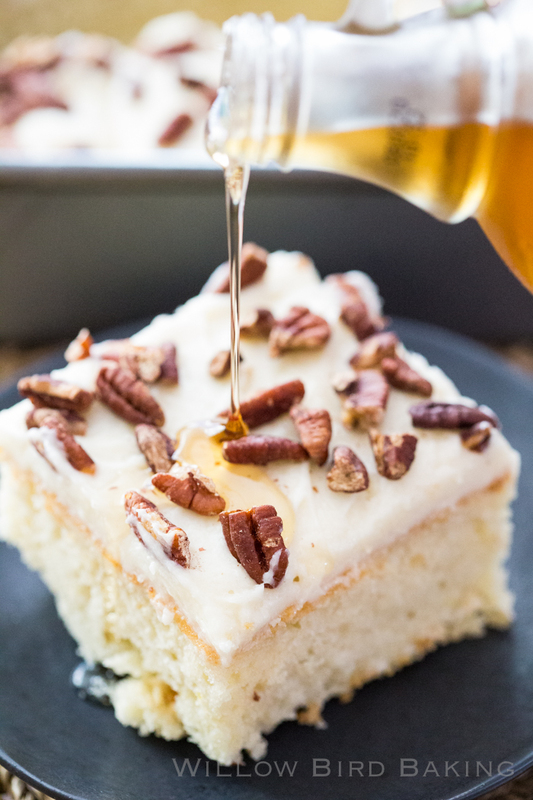 Top with toasted pecans and a drizzle of maple syrup. Serve immediately. Join/support/volunteer for your local League of Women Voters. The LWV is a non-partisan group devoted to voter education and registration. In the last year, our local league (just our small city) has registered 500 new voters, plus nearly 100 on September 23, which was National Voter Registration Day. We staff the weekly Farmers’ Market and the annual street fair. Early in the school year, we register first yer students at the three colleges in our city. We have volunteers at our train station. We work with the local high schools to register students in the spring. Democracy is not a spectator sport. Get involved!